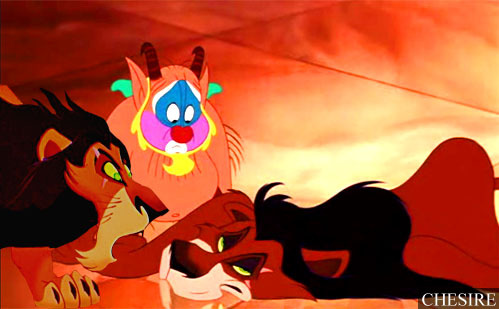 Scar's fate. . Wallpaper and background images in the The Lion King club tagged: disney the lion king scar funny fate crossover. This The Lion King photo might contain anime, komik, manga, kartun, and buku komik. lol i'd be scared too! Who is that goat dude off to the side? A demon, maybe? ^lol that's Philoctetes. Phil for short. He's Hercules's trainer. Lol scar's like "holly crap"